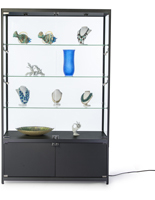 This Display Cabinet is an Exhibit In Itself! 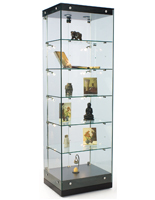 This Display Cabinet Forms a Glass and Metal Hexagon! 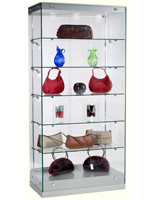 Buy it Online at DisplayCabinets2Go.com! 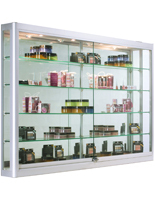 Seven 20-watt LED side lights spaced over 2 tracks shine onto your best-selling products! 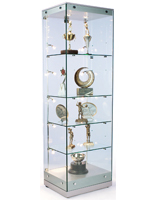 This glass display cabinet features a hexagonal design in a wider format when compared with our standard tower models. 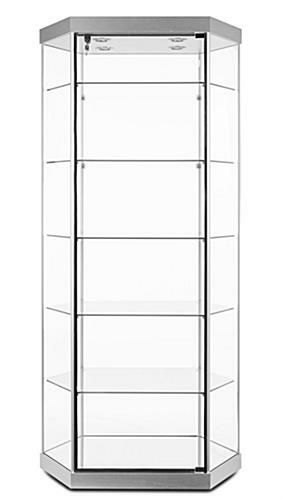 The case comes with a silver metallic laminate on top and bottom. 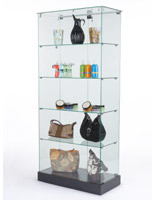 Silver anodized aluminum extrusions form the frame and the cabinet comes with five tempered glass shelves. In addition to the side mount track lighting, top LED spotlights shine downward onto the mirrored deck for a beautiful presentation!